Dubdil Alar is a Dunmer Telvanni mage found at Dubdil Alar Tower. He will begin a dangerous magical experiment when the tower is approached, summoning many Daedra. 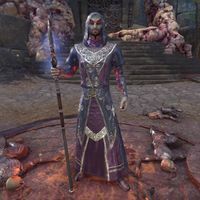 His former apprentice, Nara Varam, can be found in Vivec City. She asks you to help stop Dubdil Alar's experiment before any serious harm is done. "This is it! I've succeeded where all others have failed! I need more power! More power!" "Keep it up! We're on the right track. This will change everything." "We've done it. I feel the connection. The things we will learn will—"
"No. It can't be. Run! Run now!" "Kill this peddler of lies before it destroys us all!" "We must stop this process!" "The pain. The darkness. It keeps me alive." "It's keeping me alive to pry open the rift!" "Kill it! Don't worry about freeing me!" "That creature's using my power as an anchor!" "The rift will grow if that Daedra isn't slain!" "The creature's death caused a change to the rift!" "Someone must disrupt the rift, even—even if it means my life." "Do you want me to die? You must complete the process quickly!" "The pain. The darknes. It keeps me alive." "I'm only alive because of your deeds. Thank you for stopping my foolish mistake." "Leave me. I must recover my strength. Where did I go wrong? Perhaps if I look at my calculations once more." "Wait! There has to be another way!" "No, no! This cannot be my end!" Loop Eradicator 5 Save Dubdil Alar from the consequences of his temporal experiments. A cave called Dubdilla could be found at this location in The Elder Scrolls III: Morrowind, and is presumably named after Dubdil Alar. Taking too long to destroy the Transmutational Breach after defeating Mehz the Cozener will lead to Dubdil Alar's death, which stops you from getting the achievement. This page was last modified on 17 February 2019, at 02:48.